Typically in upland areas where there are exposures of uniform coarsely crystalline igneous rocks. The rock mass at depth is under high pressure from underlying rocks. It tends to be uniform and lack fractures. As progressive erosion occurs, the rock mass is subjected to progressively lower pressure of overlying rocks which leads to tension in directions at right angles to the land surface. This tension is relieved by formation of cracks which follow the land surface - they are relatively flat on plateaus, but can be steep on the flanks of mountains which are called exfoliation domes. Once the cracks develop, water enters and causes chemical weathering leading to the formation of new low-density minerals. 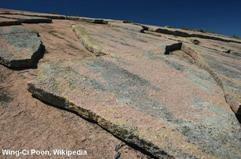 This enhances the cracks and encourages slabs of rock to detach from the surface.